Maouelainin Ben Khalihanna Maoulainin, nominated by HM King Mohammed VI on saturday march 25th 2006 in Laayoune as Secretary General of the Royal Advisory Council for Saharan Affairs (CORCAS), was born in 1949 in Aousserd. Having obtained a Ph.D. in medicine in 1979, he became an expert in gynaecology in 1982. At the same time, he was appointed manager of Hassan II Hospital in Agadir until 1985. 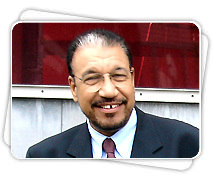 After that, he was appointed Governor of the provinces of Safi (1985- 1994), Taroudant (1994-1998), Al-Hajeb (1998-2004) and Larache since July 2004. Maouelainin Ben Khalihanna Maoulainin was decorated with the Order of Knight.